Jeff Bezos may have backed out of the deal to build an Amazon headquarters in Long Island City, NY, but apparently, he’s still very interested in New York City. The newly divorced billionaire was recently spotted apartment hunting around the Big Apple! The world’s richest man is reportedly looking to spend a cool $60 million for a bachelor pad, according to the New York Post, and has checked out apartments at the residential skyscraper 220 Central Park South, where rents average around $59,000 per month. 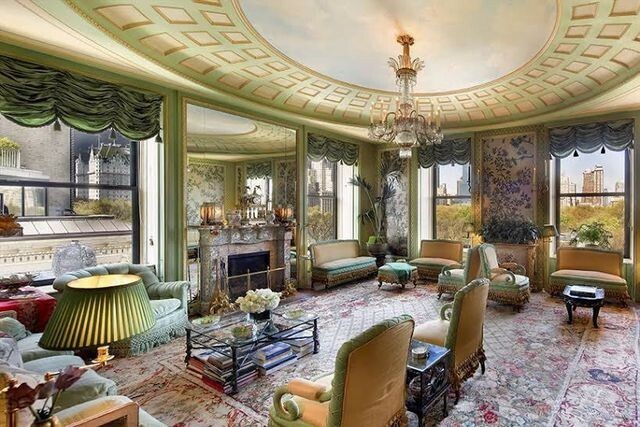 This luxe residence made headlines in January when billionaire and Citadel hedge fund founder Ken Griffin dropped $238 million to purchase four empty floors in the middle of the building, setting a record for the highest-priced home ever sold in the U.S. While Bezos might not be looking to spend over $200 million on his new digs, $60 million is still a big chunk of change. We couldn’t help but ask, what exactly can the world’s richest man buy for $60 million? To find out, we decided to dig around in our listings for posh apartments that could be his new pad. After all, while famously frugal as an exec, Bezos has been known to splash out on real estate. Here are the properties in New York he could snap up next. 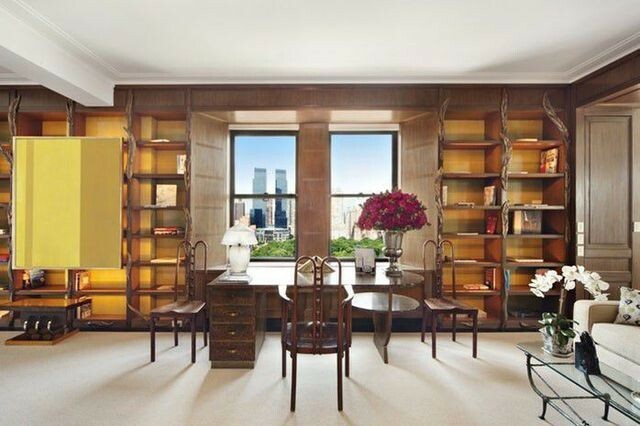 This two-story penthouse offers sweeping views of Central Park. There’s a good chance Bezos will want to settle down on “Billionaire’s Row,” a street along the southern end of Central Park known for its luxury skyscrapers. Luckily, this duplex penthouse on this street is up for grabs. The 7,128-square-foot property has four bedrooms, including the master bedroom with a wet bar. Along with a great room with floor-to-ceiling windows, the home boasts white marble countertops and an oval staircase that connects the upper and lower levels. The apartment is just a stone’s throw away from Central Park, in case Bezos wants his four kids to get off their Kindle Fire tablets and get some fresh air. Bezos and his four children would have plenty of space in this five-bedroom pad. Before their divorce, Bezos and his wife, MacKenzie, shared multiple New York apartments. 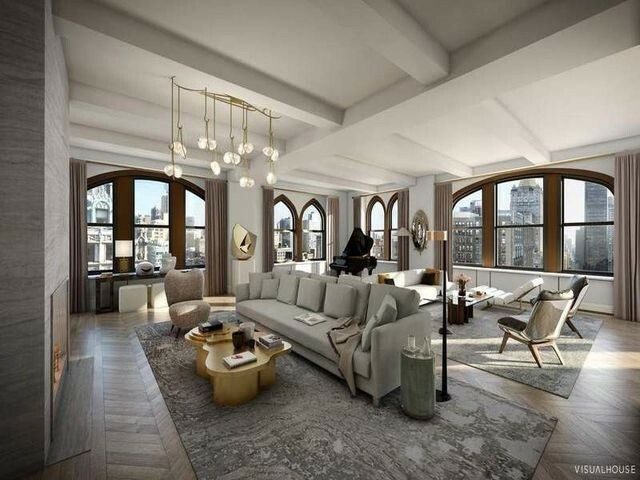 In 1999, the couple purchased three units on Central Park West in Manhattan’s Lincoln Square neighborhood for $7.65 million, and 13 years later, they snagged another unit next door for $5.3 million. Since Bezos’ former apartment was located on the west side of town, he might be seeking a postdivorce start in a new neighborhood. Enter this five-bedroom penthouse. Not only is it far from Bezos’ old Lincoln Square stomping grounds, it also boasts a private third-floor observatory with panoramic views of New York landmarks like the Empire State Building. We can totally see Bezos in this historic residence. Bezos is known to have a weakness for historic properties, and has been willing to open his considerable wallet wide for them. Case in point: In 2017, the billionaire paid $23 million in cash to purchase the former Textile Museum in Washington, DC, and convert it into a single-family home. And this seven-bedroom, 7.5-bathroom apartment could be the crown jewel of Bezos’ real estate collection. Built in 1932, the home was decorated by French interior designer Henri Samuel, who spared no expense to model the space after a French palace. Since then, the home has received multiple renovations—including the addition of a wine cellar—but Samuel’s stately designs remain. Another historic pick for Bezos is this five-bedroom, five-bathroom duplex atop the five-star Pierre Hotel. Built in 1929, the property features a large formal dining room, wood-paneled dressing rooms, and an expansive library and home office. Plus, the home has been updated with a state-of-the-art smart home system. 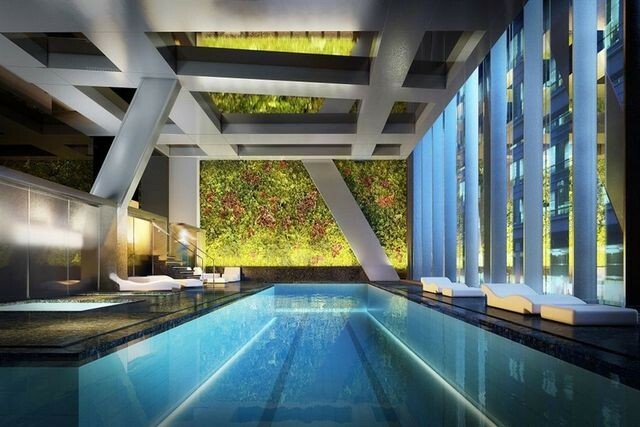 Nothing oozes luxury like an indoor pool. Some billionaires spend their riches on pricey works of art, but Bezos has the opportunity to purchase a stake in an entire art museum. Taking up two floors in an 82-story tower, this 8,000-square-foot penthouse is perched just above the Museum of Modern Art. And the condo is filled with high-end amenities, including a gas fireplace, private elevator, corner dining room facing Central Park, and an eat-in kitchen with marble countertops and designer appliances. The building offers access to a private 65-foot lap pool, gym, private theater, private wine vaults, and, of course, free museum membership.